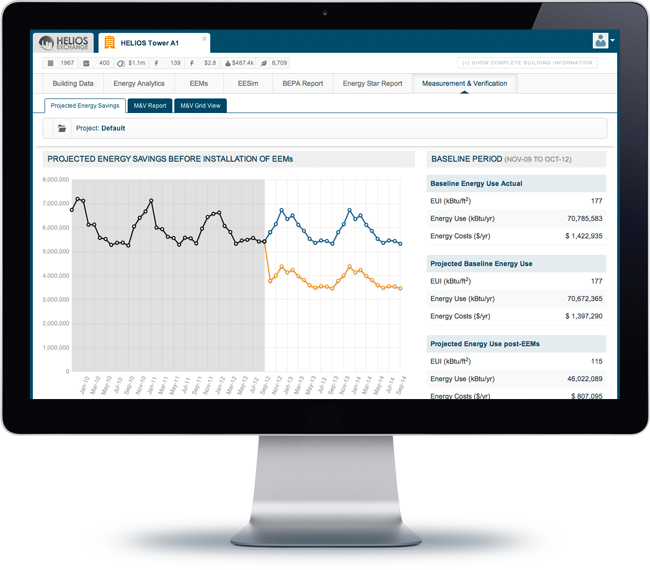 Helios streamlines energy audits, building energy modeling, and M&V processes, saving your firm engineering time, reducing costs and improving bottom line revenues. Energy audits, building energy modeling, energy retrofit analysis, and post-project measurement and evaluation of actual building performance are expensive and time consuming projects, limiting the number of analyses that can be done, with costs that can exceed project savings. Streamlined the building modeling process, replacing complex DOE-2 and EnergyPlus models with a calibrated easy to use simulation tool approved by DOE’s Argonne National Lab. Created a easy to use utility bill tracker to quickly compute baseline and actual building energy performance and actual energy savings, based on industry standard M&V protocols.